Work begins this week to finally finish the last significant piece of the first phase of the Silver Line project, which opened to riders in 2014. WASHINGTON — Work begins this week to finally finish the last significant piece of the first phase of the Silver Line project, which opened to riders in 2014. There has been a long-running dispute over how or if to realign and rebuild Old Meadow Road at Route 123 after changes tied to the McLean Metro station construction. That has now been resolved, allowing power line relocation work to begin this week. Lane closures are planned near the McLean Station between 9 a.m. and 2 p.m. on Old Meadow Road. The left turn lane onto Old Meadow Road from southbound Route 123 is also scheduled to be closed. The Metropolitan Washington Airports Authority cited a traffic study that concluded completely closing the road could add to rush hour backups. The work is planned in four phases, which a previous presentation said would include full construction starting this spring. 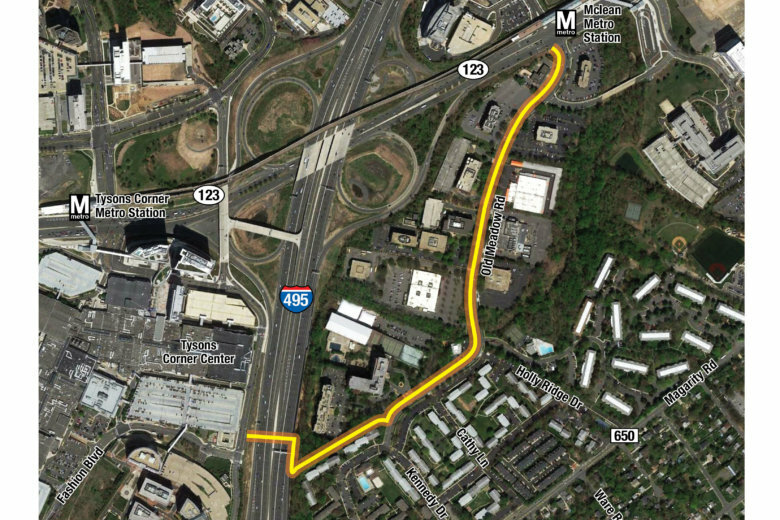 Separate work by VDOT and Fairfax County is expected next year to add a pedestrian and bike bridge over the Beltway from Tysons Corner Center to a new shared use path along Old Meadow Road, which is meant to improve safety and make it easier to walk in the area. In addition to Old Meadow Road, the Airports Authority is still working to clean up a handful of remaining issues identified elsewhere along Phase 1 by the Virginia Department of Transportation before it can be considered completely finished. Railcar testing is just beginning on Phase 2 of the Silver Line, which is expected to extend rail service from Wiehle-Reston East through Dulles Airport to Ashburn in 2020.